The ocean, which covers the vast majority of the world’s surface, holds many secrets. For more than a year a multinational team has tried to find the missing Malaysia Airlines flight MH370 on the bottom of it – without success. 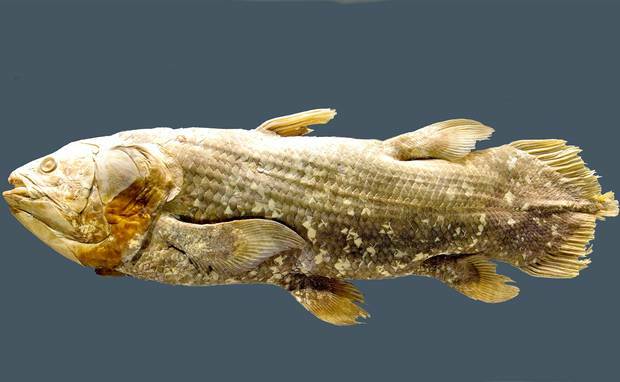 But it turns out fish fossils could help us explore it. Understanding the development of sound navigation in fish has the potential to improve remotely operated underwater vehicles, such as the equipment used in the search for MH370. A new field of research is developing that aims to convert our knowledge of the evolution of extinct species into modern innovations. Such research, which I would like to dub “palaeobiomimicry” – creating artificial structures that mimic a biological system that can be seen in fossils – is still at an embryonic stage, but I believe it has the potential to provide advances in everything from civil engineering to high-tech clothing. Put simply, the fossil record is a valuable source of innovation. Palaeobiomimicry has huge potential. All animals rely on their senses to interact with the world around them. Many artificial systems, such as aircraft, submarines and most recently driverless cars, also require systems that allow them to detect their environment. However, such systems may not necessarily operate to the best of their abilities in a rapidly changing environment because they cannot adapt to the world about them. Senses of an organism differ from engineered objects in that they function within the constraints of natural selection pressure. But by just studying living organisms you only get a snapshot of this optimisation. What is needed is a long period of time in order to see how a particular part of a body has evolved and how the optimisation has changed. Only the fossil record can provide that. 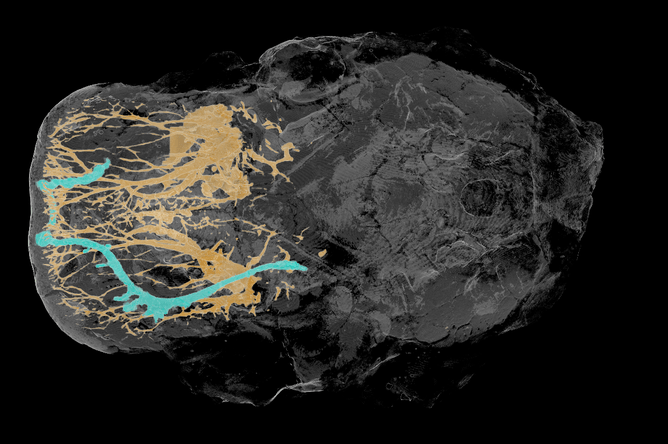 An image of the skull (grey) and internal nervous system (yellow) in the nose region of a 380 million year old lungfish from Caithness, Scotland. The images are created using micro-CT scanning which reveals in great detail the fish’s ‘sonar’ (blue tubes). Like a submarine, fish possess a system for feeling pressure waves in water produced by predators and prey, or to avoid obstacles. In a submarine this is an arrangement of hydrophones – sensors that convert changes in water pressure into an electrical signal. Together, this is called a sonar system. Instead of hydrophones, fish have an elaborate pattern of tubes and grooves that house many movement-sensitive hair cells, called the lateral line. As the delicate hair cells do not fossilise, one may look towards how the function and shape of these tubes change over time. The ideal time to investigate this phenomenon is the period that fish evolved into the first land vertebrates – the Devonian Period. We have a good grasp of what these organisms were adapting to during this period of evolution – from fish sensing pressure in water to land vertebrates sensing pressure in air. Modern palaeontology has been greatly advanced by the introduction of three-dimensional X-ray scanning techniques, similar to CAT-scanning used in hospitals. With computer-driven analyses to calculate how fluid flows through the varying shapes of sensory tubes and grooves in fossil and living fish, it will be possible to discover how sensitivity changes with differently shaped tubes. This information could then be used to create the first working adaptive artificial sonar system based on the new concept of palaeobiomimicry. A fish’s sonar is contained in the outer parts of its head and body. Adapting such a system in technology could pave the way for dramatically reducing the amount of space taken up by conventional sonar systems. It could also aid development of an apparatus that changes function with the environment, just as fish use different parts of their sonar system for different purposes. New understandings of how sonar evolved in fish could be used in remotely operated underwater vehicles for search purposes – such as the equipment used in the search for flight MH370. It could also be used for maintaining underwater installations, in submarines for research and defence, and in aquatic surveying research equipment. Senses in fossil fish are but one example. My current favourite example is research that is currently in progress at the University of Leeds on how fossil shark scales help reduce drag in water). There is a lot of stake. Duncan Wingham, the chief executive of the UK’s Natural Environment Research Council, recently warned that palaeontology will struggle to receive funding in the near future, on the grounds that it does not deliver a direct impact and benefit to society. With funding for research continuing to be tight, it is up to palaeontologists to step up to the challenge and find new ways to contribute to society.